ReStore's eclectic mix of unique merchandise is made possible from your generous contributions. 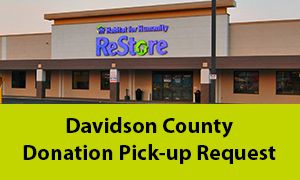 We accept donations at any of our ReStore locations during regular business hours. ReStore also provides a free pickup service for heavy items. 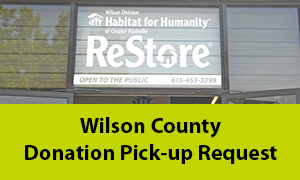 To schedule a pick up appointment, call 615.942.1290, or fill out the request form for your county below and we will return your calls and emails within two business days. Pick-up schedules will vary depending on request volume. Thank you for your donation and support as proceeds from the ReStore help fund homes for more low-income families. Doors - We accept doors in GOOD condition. They must not have holes, cracks, rot, etc. Electrical -We accept most electrical parts, wires, plugs, plates and the hardware associated with electrical wiring. Flooring material - We accept tile, hardwood, and vinyl. We will accept only new carpet. Minimum of 100 sq. ft.
Furniture -All furniture must be in good condition, no rips, tears or stains. Hardware - We accept hardware for doors, cabinets, gates, etc. Kitchen Cabinets & Vanities - Up-to-date and not damaged. They must have doors, shelving, display racks, etc. Lighting - We accept most light fixtures. We do not accept flourescent bulbs and fixtures. Lumber • Plywood • Sheetrock • Trim - We accept full and1/2 sheets of plywood. We accept full lengths of lumber. We will accept trim in smaller pieces, but not less than 6-feet long. Please, no rot or nails. Miscellaneous - Domestic/home framed artwork, area rugs, decorative accent items, collectibles, antiques. Office Furniture -We take credenzas, file cabinets and chairs. No partitions, cubicles, desks or office equipment made with particle board. Paint - Full cans of water base paint only. Roofing Material - We accept all types of roofing material such as rolled roofing material, metal roofing, and bundles of new shingles. Tubs • Sinks • Toilets - We accept new and clawfoot tubs and sinks (no faucets or plumbing) and vanities if they are in good condition and clean. We accept commodes. They must be very clean!! Tools - We accept all hand and power tools in working condition. Windows - We accept DOUBLE PANE windows only, window treatments, draperies, and wood blinds (no vinyl or aluminum). 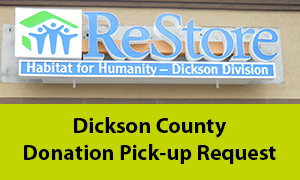 Final approval of all items is at the discretion of the donation pick-up driver and Habitat ReStore staff. Drivers and staff reserve the right to refuse materials based on current inventory and the items condition. Unfortunately, the Habitat ReStores cannot accept the following items for donation. Thank you for your understanding. Hazardous or highly flammable materials, such as oil base paint, varnish, shellac, lacquer, paint thinner, etc.